Splitting the Bill Can be a Touchy Subject – The following are important to keep in mind as you plan group meals. People do not want to “get stuck” paying for the expensive meals, additional appetizers, or alcoholic beverages of others when they do not consume the same. Not everyone can afford the same thing. Food for Thought: When the bill is split evenly between people who did not actually order things costing the same amount, those who are charged more often deduct from the tip. This is not fair to the servers. If going out as couples, it is often easiest to split the total as an even amount per couple; however, keep the first bullet point in mind! Bringing cash (and a variety of bill amounts) when you know you will be splitting the bill is a good idea. You do not want to owe anyone money after the fact or be responsible for holding up paying. For those who are comfortable with digital payment methods, consider using the apps like Venmo and PayPal. If You Plan to Split the Bill – Always make the plan known ahead of time! If you are the organizer for a group get together, but you are not the host, you should let attendees know ahead of time the bill will be split. After receiving the R.s.v.p. list, send a confirmation note to all attendees including “reminders” and stating the plan for the bill. If you make a reservation for a larger number of people, call the restaurant and ask if separate checks for a large group is possible. Also, ask if gratuity is added for a group of your size. Some establishments are unable to do separate checks; therefore, it is important to let your attendees know in advance if paying in cash will be necessary. Always tell your server you wish to split the bill when he/she first greets you. This way, when you order, your server can enter your drinks and meals as separate checks. Ultimately, Who is Responsible for the Bill? Typically, if your boss/manager is present and extended the invite then it is his/her responsibility to cover the bill. Similarly, with client lunches/dinners or interviews that take place over a meal, the hosting business is responsible for the bill. If you are hosting a meal out for friends, family, etc., the cost of the meal and gratuity is your responsibility. Think of it as hosting at your home – You do not ask guests to pay for their meal in your home when you host; therefore, you should not expect them to pay when you extend the invitation to join you out for a meal. If you are out to celebrate a special occasion for someone (birthday, promotion, etc. 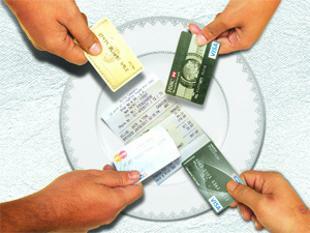 ), it is customary that his/her bill is covered by the other people at the table. As a guest, be prepared to split the honoree’s tab – bringing cash helps! No matter your age or the setting, splitting the bill can always be a difficult situation to navigate. I hope these tips help you find a solution easily and relieve you of some dining out anxiety in the future!